After meeting with President Trump, Secretary of Defense James Mattis warned that any threat from North Korea to use a nuclear weapon against the U.S. would be met with a “massive military response.” Trump initially criticized Seoul for the “appeasement” of its neighbor, but later agreed to lift restrictions preventing the country from developing more powerful missiles. He also said he was considering “stopping all trade with any country doing business with North Korea,” which would include China. “The North Korean nuclear threat is worsening by the day,” said The New York Times. Trump’s schoolyard threats have failed to intimidate Kim, and U.S. policy has been “incoherent.” Kim Jong Un understandably sees nuclear weapons as “his only guarantee of survival”—when Libyan leader Muammar al-Qaddafigave up his nuclear program, he ended up being “bombed by the U.S. and its allies, then executed by rebels.” Beijing is unlikely to agree to an oil ban, because that could cause the Kim regime’s collapse and put a united, pro-Western Korea on China’s doorstep. The only remaining option is “to engage the North Koreans” and see what Kim wants. So “what does Kim want?” said Motoko Rich and David Sanger in The New York Times. Some analysts fear he’ll use his nuclear weapons to blackmail the U.S., saying he’ll incinerate Los Angeles, Washington, or New York if we don’t withdraw our 28,000 troops from South Korea. If our troops left, he could then try to reunify the Korean peninsula by force—a “longtime goal” for Pyongyang. 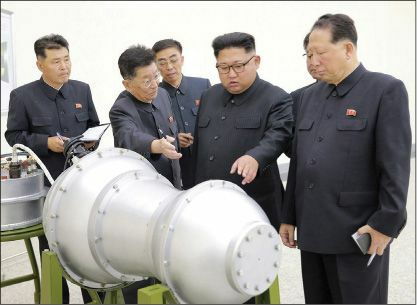 Or perhaps the North Korean dictator just wants “a nuclear capability too big to dismantle”—for his country to be treated like Pakistan and India, which no longer face international pressure to dismantle their arsenals.